What a cultural anthropologist thinks about. Recently I’ve been working with colleagues at Massey University in Palmerston North and here at Victoria University of Wellington to screen the acclaimed documentary film series Women War & Peace in Wellington. 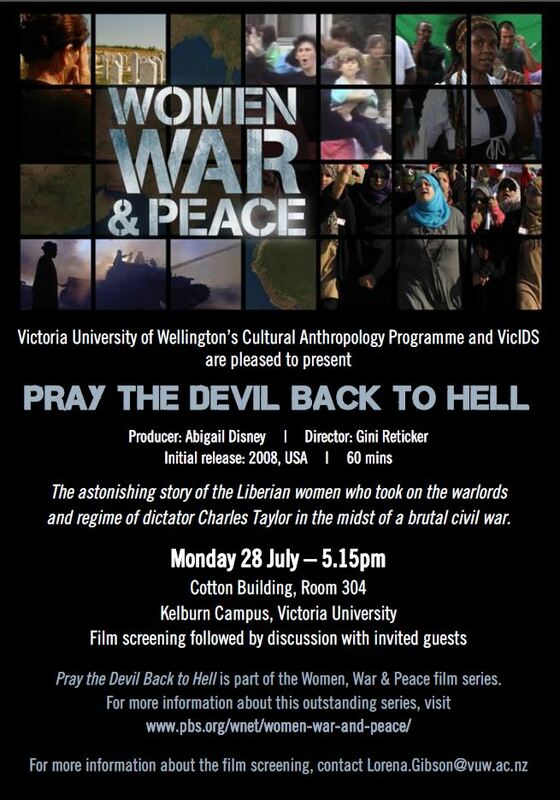 VUW’s Cultural Anthropology Programme and VicIDS are pleased to present the award-winning film Pray the Devil Back to Hell, which will be followed by a discussion with invited guests. All welcome! This film tells the astonishing story of the Liberian women who took on the warlords and regime of dictator Charles Taylor in the midst of a brutal civil war, and won a once unimaginable peace for their shattered country in 2003. As the rebel noose tightened around the capital city of Monrovia, thousands of women – ordinary mothers, grandmothers, aunts and daughters, both Christian and Muslim – formed a thin but unshakeable line between the opposing forces. Armed only with white t-shirts and the courage of their convictions, they literally faced down the killers who had turned Liberia into hell on earth. In one memorable scene, the women barricaded the site of stalled peace talks in Ghana and refused to move until a deal was done. Their demonstrates culminated in Taylor’s exile and the rise of Africa’s first female head of state, Ellen Johnson Sirleaf. Inspiring and uplifting, Pray the Devil Back to Hell is a compelling example of how grassroots activism can alter the history of nations. Posted on July 25, 2014 by lorenagibsonPosted in AnthropologyTagged Documentary film. Welcome to The New Outrigger!